It’s rare that a book is called the definitive book on the subject. 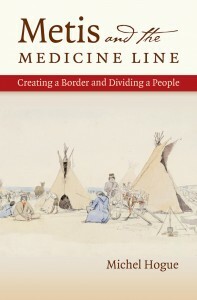 But that’s exactly how one review summed up Metis and the Medicine Line: Creating a Border and Dividing a People. The book begins with the surveyors tracing the 49th parallel through the Prairies and tracks the Metis as they interact and adjust to the changing social, environmental, and political landscape that accompanied both American and Canadian expansion. In doing so, he situates the Metis as active participants in defining the borderland while also circumventing the official narrative surrounding the Canadian-American border when it proved beneficial. In this episode of the History Slam, I talk with Professor Hogue about the book. We chat about the construction of borders, the treatment of Metis people in Canada and the United States, and the challenges of researching without a paper archive. I’m confused. I view First Nations and Metis as separate entities. Since Michel Hogue’s book deals with First Nations people as well as Metis, wouldn’t the title be more accurate as “First Nations, Metis, and the Medicine Line”? Or have I missed something? Thanks for your comment Keith. I certainly don’t want to speak for Michel, but I would say that because the primary focus is the Metis, that’s why he went with that title.